On breadth-first traversal, you visit the tree on its breadth i.e. all nodes of one level is visited before you start with another level top to bottom. 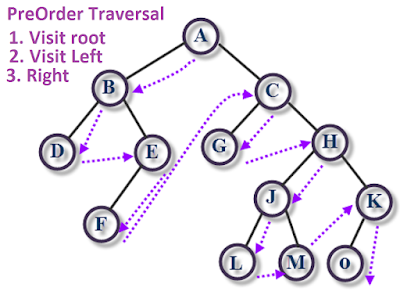 The PreOrder, InOrder, and PostOrder traversals are all examples of depth-first traversal algorithms. While traversing a tree, you need to visit three elements, root node, left subtree, and right subtree. The order in which you visit these three nodes, determine the type of algorithms. In PreOrder, you visit the root or node first, followed by left subtree and the right subtree, but in post order algorithm, you visit the root node at the last. Now you should get the point that why this algorithm is called pre-order? well, because the order is determined by root, if you visit the root first, its preOrder, if you visit the root second its inOrder and if you visit the root third, or last, its post-order traversal. Apart from these three basic traversal algorithms, there are also more sophisticated algorithms to traverse a binary tree, you can check a comprehensive course like Data Structures and Algorithms: Deep Dive Using Java to learn more about different types of tree e.g. self-balanced trees and other tree algorithms like level order traversal. You can see the code is exactly written as the steps shown above, except the base case which is very important in a recursive algorithm you can read the code like steps. This is the power of recursion, it makes code concise and highly readable. Though, you should not use recursion in production because it's prone to StackOverFlowError if a binary tree is too big to fit in memory. You should use an iterative algorithm in production to solve problems as seen earlier in Fibonacci and Palindrome problems. You can also refer a good course on data structure and algorithm to learn various ways to convert a recursive algorithm to iterative one like one way to convert a recursive algorithm to iterative one is by using an explicit Stack, Algorithms and Data Structures - Part 1 and 2 courses on Pluralsight. is a nice course to learn algorithms and Fundamental data structure. Btw, you would need a Pluralsight membership to access this course which cost around $29 per month or $299 per year. I have that and I advise all programmer to join Pluralsight because it's very important to upgrade your skills. Even if you don't have a membership, don't worry, you can still access this course by taking their 10-day free pass which provides 200 minutes of free access to all of their 5000+ courses. Here is our sample program to visit all nodes of a binary tree in preorder. In this program, we have a class called BinaryTree, which represent a binary tree. It consists of a TreeNode called root, which is the starting point of traversal in a binary tree. 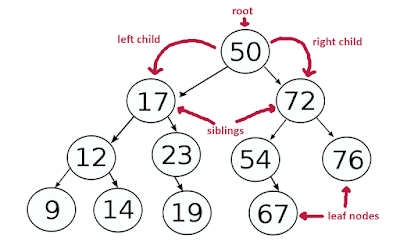 The root then refers to other tree nodes via left and right links. The logic of pre-order traversal is coded on preOrder(TreeNode node) method. The recursive algorithm first visits the node e.g. it prints it the value then recursive call the preOrder() method with left subtree, followed by right subtree. Here is also a nice diagram which also shows how the pre-order algorithm traverses a binary tree. . If you like books, you can also see Introduction to Algorithms by Thomas H. Corman to learn more about binary tree algorithms. Finally here is our Java program to traverse a binary tree in pre-order. The nodes are printed accordingly. * Java Program to traverse a binary tree using PreOrder traversal. * to left and right subtree. You can see that nodes are printed as per the pre-order traversal algorithm. The root node is always get printed first in pre-order traversal and in last on post-order traversal algorithm. That's all about how to traverse a binary tree in PreOrder traversal in Java. The recursive algorithm is very simple and hardly required 3 to 4 lines of code. Just remember that in preOrder traversal you visit node first, followed by left subtree and finally right subtree. Thanks for reading this coding interview question so far. If you like this String interview question then please share with your friends and colleagues. If you have any question or feedback then please drop a comment.